Who doesn’t love Thanksgiving? Good company, good food, and even better dessert. It’s all fun and games until you end up in a self-induced food coma and need to be rolled away from the dinner table. We’ve all been there. Then the next day comes around and we’re faced with that moment we all dread…. Stepping on the scale after that epic cheat meal. You then get eaters remorse, feel like garbage, and feel as those you lost all of the gains you worked so hard for. How do we prevent this from happening? Ditch the bread and butter! Indulging in bread before the meal is going to add extra carbs and fats that you don’t need. Not to mention, it will fill you up before you get to the good stuff! Load up on Veggies. Vegetables contain a variety of vitamins, minerals, and micronutrients. They are healthy carbohydrates, minimal on calories, and high in fiber. Don’t be afraid to go back for seconds! Turkey is your friend. 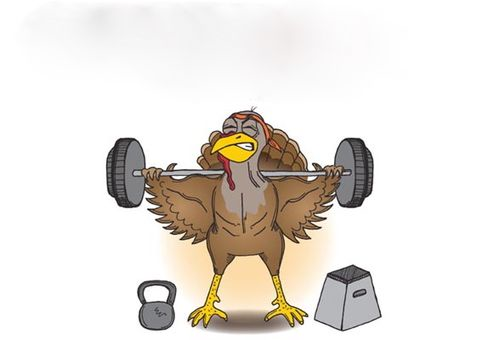 Turkey is a lean protein, meaning it is high in protein but low in fat. Bring on all the protein! Save room for dessert! Yep, you heard me right! Never deprive yourself, especially of that delicious homemade pumpkin pie. Life is meant to be enjoyable and it is okay to treat yourself to dessert every now and then… in moderation of course. Having 5 slices of grandma’s homemade apple pie…maybe not the best idea! Ask for half a slice. This should be just enough to get a taste and to satisfy that demanding sweet tooth. Whether you’re hosting family dinner or just bringing a dish to pass, try these macro friendly alternatives of your favorite Thanksgiving dishes…. Your family won’t even know the difference! What would Thanksgiving be without gravy? When it comes to Thanksgiving dinner, it is no secret that gravy is an absolute necessity. Very tasty, yes, but also is an easy way to mindlessly add some extra calories to your dinner. Standard homemade gravy packs a ton of carbs and fat for such a small serving. And let’s be honest, does anyone only ever use only one serving of gravy? 1.) In a saucepan over medium heat, melt the butter. Whisk in flour and cook for 1-2 minutes. 2.) Gradually whisk in broth and water until well mixed. Bring to a boil, reduce heat to low and simmer for 10 minutes. 3.) Stir in sherry, pepper and turkey bits. Serve warm in a gravy boat, creamer or small tea pot. A Thanksgiving dinner table would not be complete without green bean casserole. It’s vegetables so it HAS to be healthy, right? Wrong. This creamy crunchy dish packs a good flavor, but the majority of the ingredients come from processed foods that are loaded with sodium and fat. Canned green beans don’t offer as many health benefits as fresh green beans either. Making small changes to this simple recipe can make a huge difference to your diet, without compromising the taste. Preheat oven to 350 degrees. Spray large baking dish with cooking spray and set aside. Spray a large skillet with cooking spray. Saute onions, garlic and mushrooms in ½ cup of water. Stir occasionally until the water is completely evaporated. Remove onions and mushrooms from pan and place in a medium bowl. Thaw out frozen green beans (if using fresh, steam green beans and clip off ends. Place in large pot of boiling water until tender, approx 5 minutes. Drain.) Add green beans to the bowl with mushrooms and onions. Cool to room temp before adding sauce mixture. In a small bowl, mix together sauce ingredients. Add sauce to the green beans and toss until well coated. Add everything to the prepared baking dish. Mix topping in a small bowl and sprinkle over top. Bake uncovered 35-40 minutes or until topping is golden brown. Sweet potato casserole…. A staple in any holiday meal and one of my personal favorites. This dish finds its way onto my Thanksgiving table every year. It’s the best of both worlds. Potatoes, sugar, marshmallows… What’s not to love? Maybe the whopping 315 calories and 5 teaspoons of sugar for just one small ½ cup serving….Yikes! Cut sweet potatoes into large chunks; boil potatoes in a large pot covered with water until potatoes are soft if pierced with a fork. Drain and return to the pot. Lightly spray a pie dish, casserole dish or even individual ramekins with oil, spoon in sweet potatoes. Sprinkle with pecans and top with marshmallows. Bake for 15 minutes. I think we can all agree that dessert is the best part of any meal, especially Thanksgiving dinner. I would skip straight to dessert if I could! There is nothing better than a homemade pumpkin pie with mounds and mounds of whipped cream on it. If you’re going to indulge, indulge smart. On average, one slice of pumpkin pie contains over 25 grams or 6 teaspoons of sugar!! This modified recipe nearly cuts the calories, carbohydrates, fat, and sugar in half! Lightly dust a large cutting board or flat surface with flour. Roll out room temp pie crust sheet so that it is thin enough to cut off 30%. Your final crust should weigh 5 oz. Place into a 9 inch pie dish, cutting off excess dough. Place pumpkin puree in a large bowl. Add butter and mix well. Pour filling into unbaked pie crust. Bake approximately 70-75 minutes or until toothpick in center comes out clean. Let cool, and enjoy with your favorite toppings!